EFFECTS AND ADVANTAGES: The user is immobilized in the bed. 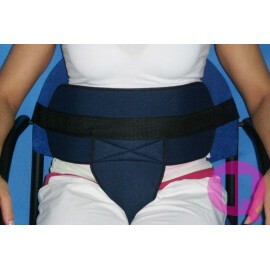 The restraint belt immobilized the abdominal and perineal area and the shoulders. The restraint belt wears a strip of polypropylene to fix at the user in the bed and prevent that user is moved both sideways. COMPOSITION: Antelina, velour and foam. The locking system is Ironclip. MEASURE: the size of this model is M (75-125 cm) This size is more common. But we can manufacture in other sizes: S (60-90 cm) and L (105-145 cm). Regarding size of the bed, this model is for bed of 90 cm but it is possible manufacture the belt to bed of 105 cm and 150 cm. WARRANTY: We recommend the ironclip locking system. If you choose the magnetic locking system please, not wet the magnetic close and change the locking system at 3 months. *** We are manufactures, then if you need other size or modification please, contact us.